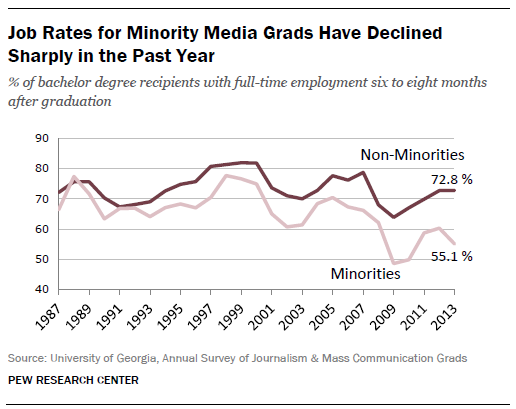 Job growth for recent journalism and mass communication grads stalled in 2013 with minority students hit particularly hard by the slowdown, according to a new University of Georgia survey of nearly 1,800 bachelor’s and master’s degree recipients. In addition to a slight tightening of the job market, the survey shows that salaries and benefits have also stagnated. Yet these sobering economic realities have not resulted in more pessimism among the 2013 grads who report relatively high levels of job satisfaction and voice little regret about their career choices. In 2013, 65% of bachelor’s degree holders in journalism and mass communication found full-time work six to eight months after graduation, a slight decrease from 65.6% in 2013 and the first decline since 2009, when the recession was at its peak. Additionally, unemployment for the recent graduates rose to 12.2% in 2013, up from 10.7% in 2012. That jobless number, however, is equal to the overall rate for 20-24 year olds. For minorities, the news from the job market was worse. Only 55.1% of the 2013 minority bachelor’s degree recipients reported full-time employment at the time they returned the survey, down significantly from 60.3% in 2012. The non-minority employment rate of 72.8% was unchanged from the previous year and stood 18 percentage points higher than minorities. That represents the highest discrepancy recorded in the 27 years that Dr. Lee Becker has conducted the survey. “After some slight improvement…this year represents a lack of any real change,” stated Becker, director of the James M. Cox Jr. Center for International Mass Communication Training and Research at the University of Georgia. The study doesn’t offer much better news about salaries and benefits for recent graduates. After salaries ticked up in each of the past three years, the median annual salary for full-time grads remained unchanged in 2013, at $32,000. For the most part, the availability of medical benefits for full-time employees remained static, with the largest change occurring in maternity/paternity benefits. About half (51 %) of 2013 graduates with full-time jobs reported that their employers paid all or part of maternity and paternity benefits — up from 48% in 2012. Despite a sluggish job market, the bachelor’s degree graduates tended to have a positive outlook on their career. Those saying they were very satisfied with their job rose from 40% in 2012 to 42% in 2013, the second highest level ever recorded in these reports. In addition, about two-thirds (68%) of those working full-time reported no regrets with their career choice, a number that has remained steady in recent years. And 84% of the job holders say they were moderately or very committed to their employers — the high water mark since the survey began tracking such sentiment in 2000. Becker suggested that the positive outlook among recent graduates may reflect a sense of accomplishment in securing employment in a challenging job market. Indeed, the percentage of recent grads who said they were very committed to their employers began spiking significantly in the period around the 2008 recession. Although there was little change in employment and compensation in 2013, there were some shifts in job duties for recent grads. The proportion of employed bachelor’s degree holders writing and editing for the Web dropped to 60% in 2013, down from 64% a year earlier. And blogging seems to be on the decline. In 2013, the percentage of recently employed graduates who were either creating or using blogs as part of their job was 27%—down from 36% three years earlier. At the same time, producing mobile content is becoming a significantly bigger part of the work experience these days. 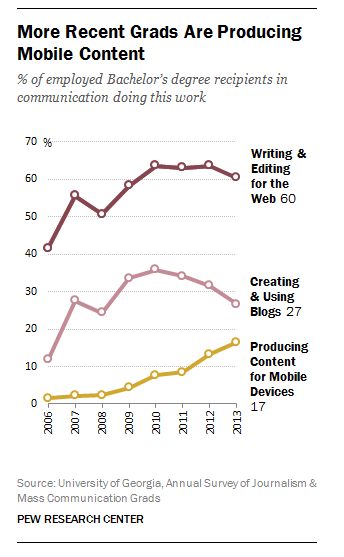 In 2013, 17% of employed bachelor’s degree holders said they produced content for mobile devices, up from 13 % in 2012 and nearly double the 9% reported in 2011.